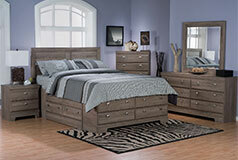 Add a splash of contemporary flair and a burst of fresh style to your home with this Olivia storage bedroom package. Understated details like scalloped hollows and sleek pewter handles bring modern sophistication to your space, combining affordability with elegance. Rest at ease knowing this Olivia package will bring you long-lasting storage thanks to high-quality engineered wood drawers within the bed side. Key Features: Distinguished, versatile design is enhanced with subtle scalloped ribbing. Sleek pewter handles add sheen to each drawer. Durability and longevity are ensured with quality materials and construction. The classic-yet-contemporary design is highlighted with light-coloured lacquer. Enjoy ample storage thanks to drawers discretely featured within the bedside. 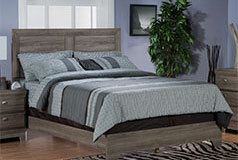 Engineered wood products are manufactured to maximize the natural strength and stamina of wood. Such wood products can be beautifully finished with paints, stains, veneers or varnishes. Placed on top of construction-grade materials, laminated wood mimics common wood textures and hues with the durability and versatility of laminate. Virtually defect free, laminated wood grain is an exceptionally cost-effective alternative to natural wood veneers. The timeless, contemporary design of this package is beautifully offset by this fresh and light hue. Sleek pewter bars adorn each drawer to bring versatility to this Olivia package. 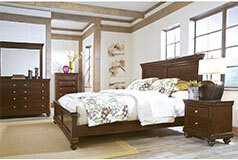 Package includes: One full-size storage bed (headboard, storage footboard and drawers) and chest.